Medicinal uses: Contains a high mucilage content therefore makes a good demulcent and soothes respiratory problems. It is also useful for sore or inflamed skin due to its emollient action. It can be applied as freshly squeezed juice, in a poultice, or as an infusion. The flowers encourage sweating and the leaves are diuretic. The seed oil is particularly rich in polyunsaturated fats. The oil can be used for premenstrual complaints, rheumatic problems, eczema, and other chronic skin conditions (Chevallier 178-9). 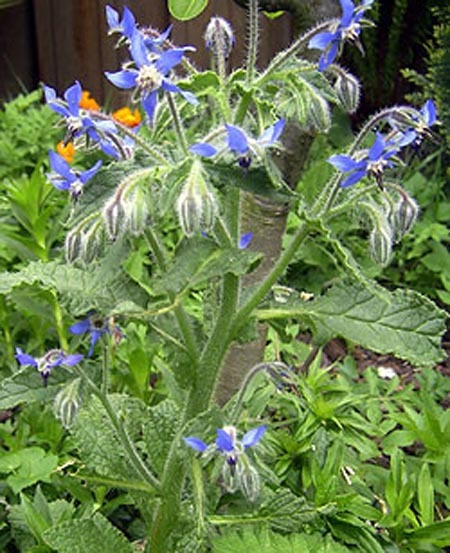 Additional uses: Borage can be used as a flavoring in a variety of foods. Its leaves and stems may be prepared similar to spinach but with a distinct cucumber flavor. Borage is also said to strengthen the resistance to insects and disease of any plants neighboring it, especially strawberries. This plant is also a favorite of bees (Kowalchik 53-4). Cautions: Due to the presence of pyrrolizide alkaloids internal intake of this plant should be minimized. Also care should be taken when applying to broken skin (Chevallier 178-9).